Selected and thickened stainless steel, good hardness, high strength, anti-corrosion, anti-embroidery, this baking tools have a longer service life. The kit makes cookies that can be easily assembled into stand-up, lifelike Christmas scenes to make baking more enjoyable. 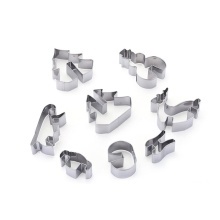 8/10 pieces christmas cookie cutter set. It is ideal for family use, increase family interaction. Selected and thickened stainless steel, good hardness, high strength, anti-corrosion, anti-embroidery, this baking tools have a longer service life. The kit makes cookies that can be easily assembled into stand-up, lifelike Christmas scenes to make baking more enjoyable. Add fun to the kitchen and make Christmas even more fun and different for kids.